5 rounds Remington® Premier® AccuTip Bonded Sabot Slugs. Punch huge holes with pinpoint accuracy, plain and simple. The AccuTip doesn't just look intimidating, it's flattening whitetails and competitors in the tipped-slug game with devastating ferocity! In field-testing, both the 12 and 20 gauge versions produced huge wound channels and crumpled every deer they touched with a single shot. High weight retention at all distances. For fully rifled barrels only. 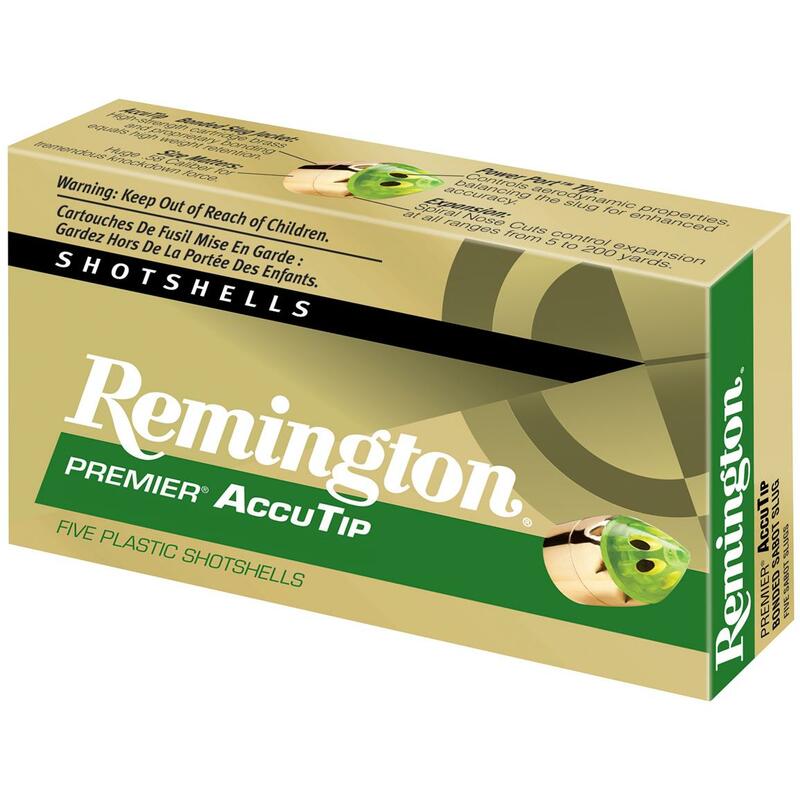 Remington Premier, 20 Gauge, 3 , AccuTip Bonded Sabot Slugs, 5 Rounds is rated 4.8 out of 5 by 36. Rated 5 out of 5 by ordtech from BEST ANYWHERE, RIFLE LIKE ACCURACY!! I have tried all the major brands and the AccuTip's are the best ammo for my Savage 220 topped with a Nikon Slugger Scope. This combo make 100 yard shots routine. They have video's of people making shots out to 300 yards but that's out of my league. With a good rest and a little practice 200 yards is highly doable. Rated 5 out of 5 by wild bill from Great Deal! Glad to be a member. Rated 4 out of 5 by sharpknife from Very accurate The most accurate ammo I have found for my Savage 220, although some lots seem better than others. Can be hard to find at times. If you like it stock up when you can! Rated 5 out of 5 by BOWHUNTERCOP from Tack Driver Been using these slugs in my Savage 220 for 7 or 8 years, they fly like darts, and with this firearm I have shot 3/4" groups at 100 yards, at 200 yards 1.5" groups. In fact I have a few other 20ga slug guns and I switched to these slugs, all shooting much better versus the prior slugs used. They are great on game as well. Rated 5 out of 5 by bigt405 from Best price around These are the most accurate shooting bullet out of my Savage 220 and usually the hardest to find. SG not only had them in stock but at the lowest price I have seen in a while. Rated 5 out of 5 by Gordy from Absolutely WOW! All I can say when using these sabot slugs in my Savage 220 is WOW! Amazing flight patterns and accuracy! They are expensive though, so I recommend NOT using them for target practicing, or sighting in your gun! They really tear deer up puncturing both lungs with one shot! The use of multiple shots are definitely not needed (as long as your gun is sighted in correctly, and your aim is good). They will run you almost $2.50 per shot, not cheap, but very much worth when deer hunting. Just don't crazy :DThese slugs have been tested on the tube up to 300yds with absolutely amazing results! Who knew 30yrs ago we would be turning slug guns into rifles?! Amazing product, highly recommend! Rated 5 out of 5 by wild bill from Great Price!